In this book are contained two short books by the best selling author Vera Brittain - Seeds of Chaos and Humiliation with Honour. For this new edition there is an introduction by Aleksandra Bennett of McMaster University in Canada and a new preface by Shirley Williams, Vera Brittain's daughter. Vera Brittain worked as a nurse in the First World War - a war in which her brother, his best friend and her own fiance were killed. Shorly after the War she published her classic book Testament of Youth and moved gradually towards a position of Christian pacifism. It was during the Second World War that she published two short books (Seeds of Chaos and Humiliation with Honour) in which she argued the pacifist cause and as the horrors of the end of the Second World War became manifest (Dresden, Hiroshima) her books became increasingly well know and influential. It was in 1943 that Vera Brittain began work on these books which she termed a 'final appeal' against saturation bombing. - Publisher This book reprints for the first time two short works by the best selling author Vera Brittain - Seed of Chaos and Humiliation with Honour. For this new edition there is an introduction by Aleksandra Bennett of Carleton University in Canada and a preface by Shirley Williams, Vera Brittain's daughter. Vera Brittain worked as a nurse in the First World War - a war in which her brother, his best friend and her own fiance were killed. In 1933 she published her classic book Testament of Youth and moved gradually towards a position of Christian pacifism. In 1942, during the Second World War, Brittain published Humiliation with Honour, a statement of her pacifist beliefs, in the form of letters to her son John. Two years later she followed this with a denunciation of the Allies' policy of the saturation bombing of German cities, Seed of Chaos, in which she argued forcefully that there was no evidence that the mass bombing of great centres of population would either shorten the war or break civilian morale. In Britain, Seed of Chaos was attacked by George Orwell, while in the United States, where it was published as Massacre by Bombing, Vera Brittain's protest stirred up a storm of controversy which reached as far as the White House when President Roosevelt issued a statement attacking the book. Vera Brittain worked as a nurse in the First World War - a war in which her brother, his best friend and her own fiancé were killed. Shortly after the War she published her classic book Testament of Youth and moved gradually towards a position of Christian pacifism. It was during the Second World War that she published the two short books included in this volume, Seeds of Chaos and Humiliation with Honour. In them she argued the pacifist cause and as the horrors of the end of the Second World War became manifest (Dresden, Hiroshima) her books became increasingly well know and influential. It was in 1943 that Vera Brittain began work on these books, which she termed a 'final appeal' against saturation bombing. Hamburg 'surpassed them all in horror': On the night of 27-28 July 1943, several square miles of the residential and commercial heart of the city were engulfed in a firestorm which burned for several hours at a temperature of 1,000 degrees centigrade. This is the background out of which these powerful texts were inspired. This edition includes an introduction by Aleksandra Bennett of McMaster University in Canada and a preface by Shirley Williams, Vera Brittain's daughter. This book reprints for the first time two short works by the best selling author Vera Brittain - Seed of Chaos and Humiliation with Honour. For this new edition there is an introduction by Aleksandra Bennett of Carleton University in Canada and a preface by Shirley Williams, Vera Brittain's daughter. Vera Brittain worked as a nurse in the First World War - a war in which her brother, his best friend and her own fiance were killed. In 1933 she published her classic book Testament of Youth and moved gradually towards a position of Christian pacifism. In 1942, during the Second World War, Brittain published Humiliation with Honour, a statement of her pacifist beliefs, in the form of letters to her son John. Two years later she followed this with a denunciation of the Allies' policy of the saturation bombing of German cities, Seed of Chaos, in which she argued forcefully that there was no evidence that the mass bombing of great centres of population would either shorten the war or break civilian morale. In Britain, Seed of Chaos was attacked by George Orwell, while in the United States, where it was published as Massacre by Bombing, Vera Brittain's protest stirred up a storm of controversy which reached as far as the White House when President Roosevelt issued a statement attacking the book. 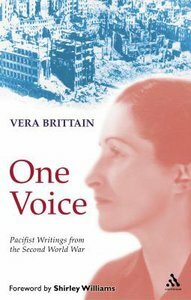 Vera Brittain (18931970) served as a nurse in the British armed forces in World War I and afterward devoted herself to the causes of peace and feminism. She wrote twenty-nine books, of which "Testament of Youth" is the best-known.<BR> Mark Bostridge is a biographer and literary critic who lives in London.